We Project Pilots aren’t Project Managers, we can do project management and of course we can manage our own efforts, but we leave it to the second princes, black belts and scrum masters to dedicate themselves to their glamorous disciplines. Project Pilots are broom pushers, we like to get our hands dirty with the largely uncredited schedule detail required in order to ensure that projects are delivered within time, cost and scope constraints. So it was with mixed expectations that we picked up the latest edition of Project Management for Dummies. It was going to be too simple, too highfalutin or just not much use to project planners at all, right? Wrong! 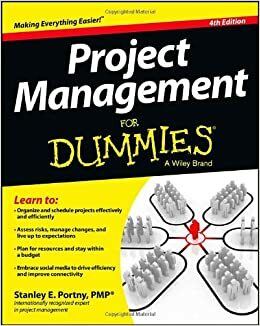 Project Management for Dummies covers the basics in a simple pragmatic way with really useful advice for project managers of all types and as such is a contribution to my own modest desire to improve the world by delivering successful projects. It’s on the subject of Developing Achievable Project Schedules that Project Management for Dummies strikes a particular chord; who could fail to be impressed (and educated) by the simplicity with which the fundamental requirements for a sound project schedule are laid out! Of course Project Management for Dummies is no substitute for proper training and years of hard experience in the project management and project planning professions, but it’s a great guide for beginners and a reality check for the experts. What other recommendation can I give? I’ve actually paid for my own copy and I advise you to do so too.